The only sport that Alabamians enjoy more than Alabama politics is college football. We especially love the Alabama vs. Auburn football game. Folks, this is Alabama/Auburn week in Alabama. The Alabama vs. Auburn annual event is one of the fiercest of college football rivalries. It is the game of the year. It is a state civil war that divides friends and even families. It is bragging rights for the entire year. The loser has to live with his boasting next door neighbor for 364 days. It seems that one must choose a side no matter if you despise college football and could care less who wins. Newcomers to our state are bewildered on this fall day each year. They cannot comprehend the madness that surrounds this epic war. It is truly that, a war. It is the game of the year. Young boys all over Alabama grow up playing football in their front yards and dream of playing in this big game. It is said that when these two rivals meet one can throw out the record books. However, that is not necessarily true. In fact, in 90 percent of the games the favorite has won. A lot of SEC championships and bowl games have been decided in the game. It has made many Alabamians’ Thanksgiving holiday either joyous or sad. I liked the rivalry better when it was played at Legion Field, but I am an old-timer in heart and age. The game was not played for 40-years between 1908 and 1948. Myth has it that the game was halted because of the intense rivalry. That is not the case. The true history of the ceasing and renewal is that after the 1907 games, the schools could not agree on the terms of the contract. The dispute involved meal money, lodging, officials and how many players each side could bring. Football was not the passion it is today so the two schools let the matter rest and the fans did not seem to care. That began to change as college football grew to a major sport in the 1940s. When the series resumed, a popular myth was that the Alabama Legislature called a special meeting and forced the teams to play. This never happened, but the Alabama House of Representatives did pass a resolution in 1947 to encourage, not force, the schools to meet in football, and the officials at Alabama and Auburn agreed. The Presidents of Auburn and Alabama simply talked with each other and decided it would be in the best interest of the schools to start playing again on an annual basis. The contract was drawn up, the papers signed and the rivals literally buried the hatchet. On the morning of December 4, 1948, the president of each school’s student bodies dug a hole at Birmingham’s Woodrow Wilson Park, tossed a hatchet in and buried it. The series began again in 1948 with a 55-0 Alabama victory and the teams have squared off every season since. Alabama leads the series 45-36-1. This record reveals that Alabama has not dominated the series, like it has against other SEC rivals and other national powerhouse programs. In the political arena, the University of Alabama alumni have dominated the Alabama political scene. 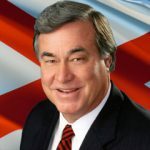 During the 60-year period from 1910 through the 1970s, almost every Alabama Governor, U. S. Senator, and Congressman was a graduate of the University of Alabama, either undergraduate, Law school, or both. Currently, our state’s most prominent and powerful political figure, Richard Shelby, is a graduate as an undergraduate and the Law School at the University. A couple of Auburn men broke through the ice to grab the brass ring of Alabama politics, the Governor’s office, Gordon Persons won in 1950 and Fob James, a former Auburn halfback won in 1978 as a Democrat and came back and won a second term as a Republican in 1994. In recent years, since 1982, Governors George Wallace, Don Siegelman, Bob Riley and Robert Bentley have all been Alabama Alumni. However, our current Governor, Kay Ivey, is an Auburn girl through and through. She and her best friend, Jimmy Rane, became political allies at Auburn. They both have turned out fairly well. Newly elected State Representative, Wes Allen of Pike County, was a walk-on wideout on one of Alabama’s National Championship teams. He was coached by Gene Stallings and Dabo Swinney. Wes’s father is State Senator Gearld West of Tuscaloosa. This is a first in Alabama political history, a father and a son tandem serving in the Alabama Legislature together.